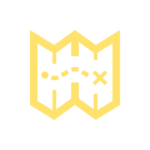 This blog post contains affiliate links. (Any link with an * after it.) 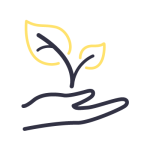 I use these links because the small commission I make allows me to keep creating intuitive, practical legal (and biz) resources. Plus it never changes the price you pay. I own this book and am including it because I think it might help you. Legally, how important is it to have a business plan? What are the pros and cons of developing a traditional business plan for a small/just-starting business? I feel like I need one, but keep putting it off. A business plan is critical for every single creative business. But…you don’t need a formal business plan. The reason you can skip the traditional format is that you aren’t getting a loan or finding investors. And since it doesn’t need to be formal, it doesn’t have to match any formatting. You can (and should) create a plan in the way that works for you. 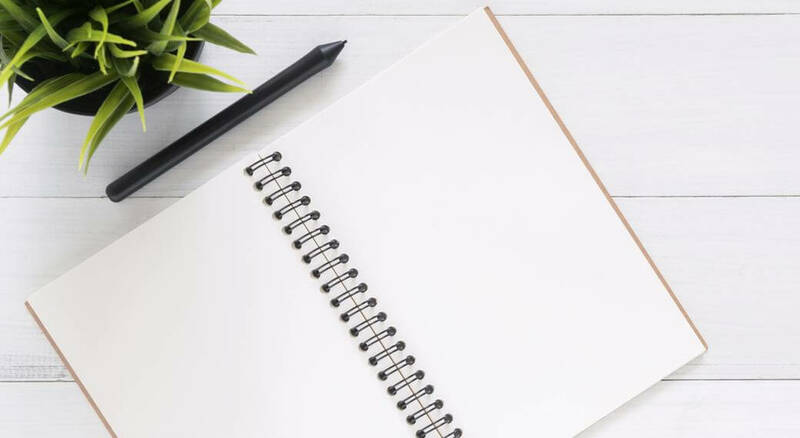 Does your creative business need a business plan? 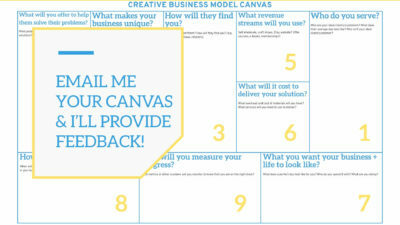 Then grab the Creative Business Model Canvas! 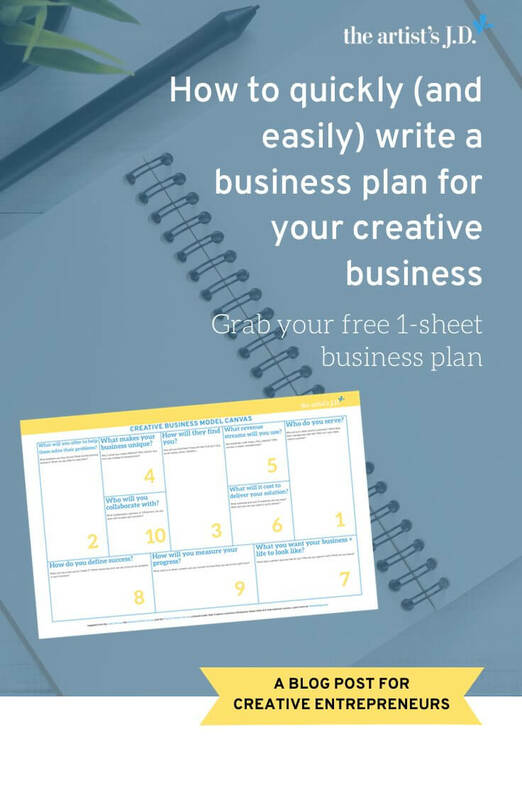 It’s a quick and easy way for you to create a business plan. All you have to do is fill out one page by answering 10 questions. Grab a PDF copy by entering your email below. It’s important to remember that your business plan isn’t set in stone. It’s almost impossible for a new, young business to predict what it’s going to look like five years in the future. And so what you put in your business plan will inevitably change and evolve over time. And that’s good. Want to dive in deeper? Then check out the resources below. Read what we covered during the broadcast! Good morning everyone! Welcome back to another In Session. 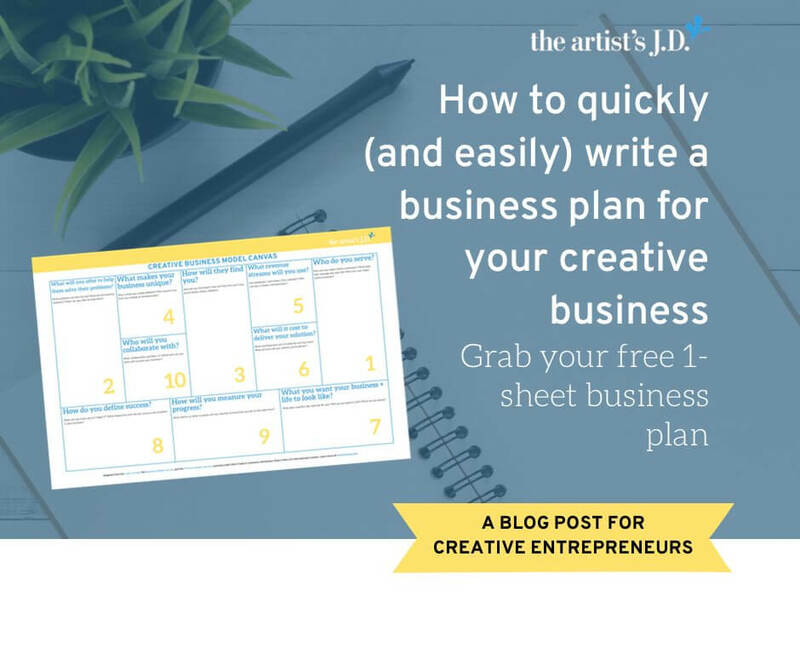 Today we’re going to talk about how to quickly and easily create a business plan for your creative business. The goal of today isn’t to create a big, formal business plan. For the vast majority of creative businesses, you are doing things on your own. You aren’t getting investors. And you don’t need to create a traditional formal business plan. The goal today isn’t to help you create a traditional, formal business plan. If that’s what you need there are lots of tools, templates, and resources out there. Instead, we are going to create a business plan for creatives. The business plan we are going to create is designed for those of you who are running a small creative business, like my friend Joan. And Joan is exactly why I created the Creative Business Model Canvas. And I told her that business plans are critical for every single creative business. Mostly because they force you to answer questions that you skip otherwise. Over the last seven years, I’ve worked with thousands of creative businesses, both as an attorney and a legal educator. Some of those businesses have become really successful. Some of those businesses have stayed stagnant. And others, unfortunately, don’t exist anymore. After watching all of these businesses, I’ve noticed a common theme with those that succeed. They have a strong business foundation in place, so they can seize big breaks when they happen. And one of those foundation pieces is having a business plan for your creative business. What goes in a business plan for creatives? 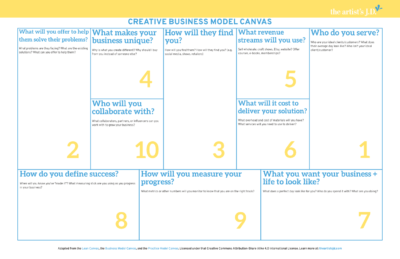 In the Creative Business Model Canvas, you are going to answer 10 questions. I want you to create a plan that is not super formal and stuffy, but that you can actually use to guide your business decisions. And to help you build that strong foundation. So that when your big break happens you can leverage it and grow your business. Rather than scrambling to get things in place to take advantage of it. And creating a really simple business plan, like this one, will help you build your foundation. 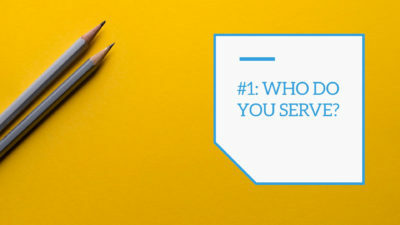 Question #1: Who is your creative business serving? Who are you serving? 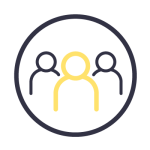 Who are your ideal clients and customers? What does his/her average day look like? And more importantly, who isn’t your ideal customer? If you are a surface pattern designer, your client could be the sewer or it could be the fabric company. Is your client the person buying your fabric off Spoonflower? Is your client someone who makes quilts? Is your client the company that licenses your designs to put on fabric? And depending on your answer, you’ll go about targeting and serving these clients very differently. If you make jewelry, are you serving an urban woman that’s into high fashion? Or a suburban mom that lives in yoga pants? You want to not only identify who you’re serving but draw a line in the sand. And say these are the people I’m not serving. Because the more you can identify your ideal client/customer and speak to them, the better chance you’ll have at making the sale. Question #2: What will you offer to help them solve their problems? But that doesn’t mean you can’t help solve a problem. For example, I pretty much constantly wear Zelma Rose jewelry. And part of the reason that I wear it is the story that Lisa’s jewelry helps me tell about who I want to think I am. I want people to perceive me as being the artsy, cool, laid-back lawyer. And even though I don’t wear much jewelry, I’ve got a statement piece on that connects and sparks a conversation with creatives. Her jewelry helps me make connections with creative people. I can always spot them in a room based on if they notice what I’m wearing and the questions they ask about it. It allows me to tell a story about who I am and connect with creative people. She’s selling a very high-end luxury jewelry product that I gladly fork over money for. And the only reason I don’t own every piece she creates is that my pocketbook can’t afford it. And so regardless of what you create, I’d like you to dig into this question. And think about the story that you are helping your customers tell to themselves and those they interact with. So question number two requires understanding what you are going to offer to help them solve their problems. Question #3: How will they find you? Next, you need to figure out how they are going to find you. And where they hang out. If you deal with local businesses, they might not be hanging out online. 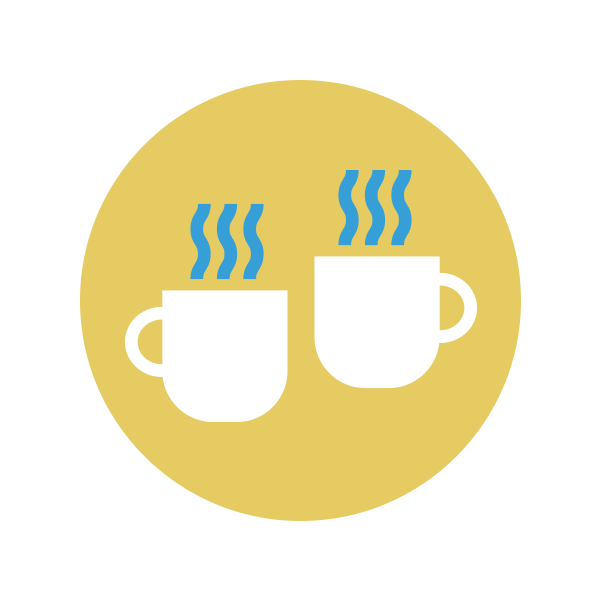 Maybe the best place to find them is by going down to the local coffee shop and working there. And making conversation, connecting with people, and learning what they need. Maybe it’s walking down to a brick and mortar store and talking face to face with shop owners. Maybe it is online. But even online, different platforms have different demographics. For many of us, Twitter is a terrible place. But if you are targeting journalists or politicians, it’s still a great tool. 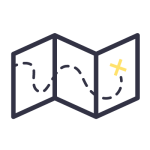 So you need to discover, what platforms you will use to connect with your ideal clients and customers. And you need to discover what places will give you the biggest bang for your buck. And then spend your time there. Early on, it’s going to be hard to know if Instagram, Pinterest, Facebook, or something else is going to give you the best return on your time. Which means you make your best guess and run an experiment. Question #4: What makes your business unique? This question is one that’s easy to talk about as creatives. And that’s what makes you, your art, your products, and your services different. What feelings do you evoke? Why is what you create different from those creating a similar thing? 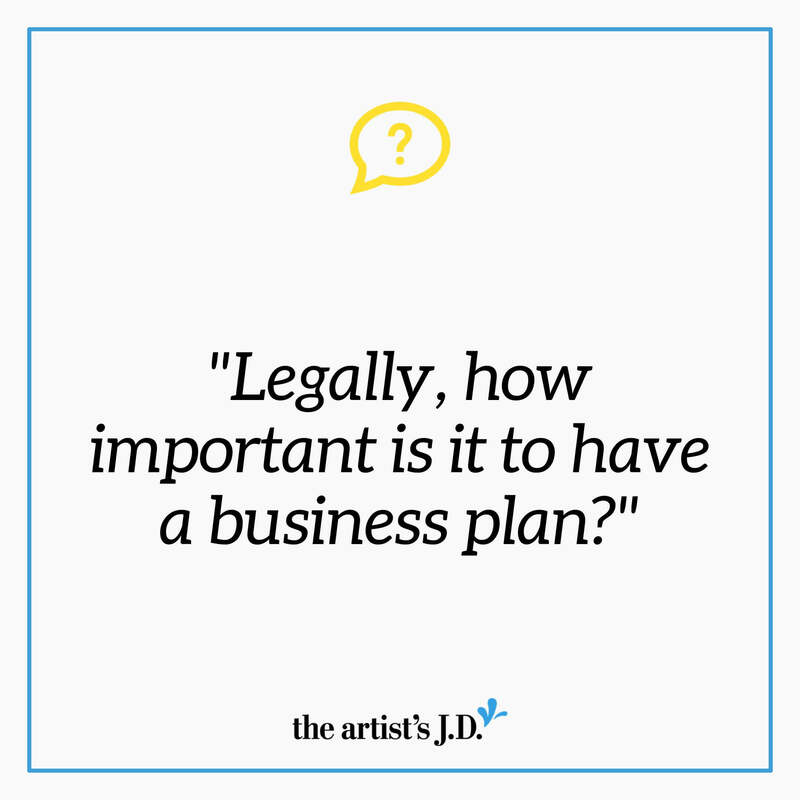 For example, there are several attorneys talking to creative business owners about the legal side of running a creative business. So what makes me different from those other attorneys? So for this question spell out what makes your business unique. Question #5: What revenue streams will you use? This question is fairly straight-forward and just asks you to narrow down what revenue streams you will use. For physical products, this could be commissions, wholesale, craft shows, and your website. For information products, this could be e-books, courses, and a membership community. For art licensing, you might sell some designs on products yourself and other designs you sell to other brands. Question #6: What will it cost to deliver your solution? This question a lot of people skip over. And that’s figuring out what expenses you’ll have when delivering your product or service to your customer. Then if you’ve got a physical product, you have the costs that go into the materials required to make (and ship) your product. Question #7: What you want your business + life to look like? The next three questions aren’t usually covered in a traditional business plan, but I think they are critical. The first is what do you want your life and business to look like? When you wake up in the morning what does a perfect day look like? Do you dream of traveling the world? And waking up in a new city every month. Where you can explore in the morning and evening while working in between? Do you want to be able to drop your kids off at school every morning? And then work while they are at school. And be able to pick them up and spend the afternoon with them? One dream I have is to live on a couple acres and have a huge garden. And I’d wake up every morning and do a little work in the garden. Then make breakfast using the ingredients I just harvested. In this question, I want you to think about what your dream life looks like and what steps you’ll need to take to get there. Because when you make business decisions, you need to understand if this is helping you get closer to or farther away from your dream life. And if so, which needs to change, the decision or what you are working towards? Question #8: How do you define success? You could be working towards a specific dollar amount. Or working towards being able to travel more. Maybe for you, that’s having enough money in the bank to buy a last-minute ticket to Paris. And to be able to travel there for two weeks and know that you’ve got your business set-up for that. So that you can work remotely and your business will continue to grow. Question #9: How will you measure your progress? And that’s followed up by question nine, what will you use to know if you are getting closer to that goal? When it comes to this question it can be easy to get sucked into vanity metrics. Things like follower count and page views. And those metrics are fine if you know that they help you get closer to your goal. For example, if you know that one out of every five Instagram followers buys from you. Then increasing your Instagram following will increase your sales. But without that connection, increasing your Instagram following isn’t doing anything for your business. So when you are answering this question make sure that it’s something directly tied to reaching your version of success. Question #10: Who will you collaborate with? The final question you are going to answer deals with who you will collaborate or partner with. Who can you do a joint promotion with that will grow both of your businesses? For example, if you are a jewelry designer you could partner with a bag designer or a clothing company. To help all of your ideal clients, easily know what works well together and create an entire outfit. What you put on this Creative Business Model Canvas (or whatever plan you make) isn’t carved in stone. You are going to answer each of these questions based on the information you have now. You are going to make guesses and assumptions. Then you’ll run experiments. And see how they pan out. And collect data along the way (don’t just go with your gut instinct). Then look at your data, update your guesses, assumptions, and plans. And then try a new experiment. Business plans aren’t something that you do once and you forget. 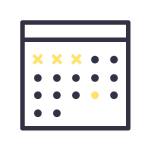 No one is going to know perfectly what his/her business will look like in a year, even if you’ve been in business for a while. For example, a while back, I felt like I had nailed down how to use Facebook to drive traffic to my website. But then they changed the algorithm. Which means I had to change up my strategy to continue to drive Facebook traffic to my website. 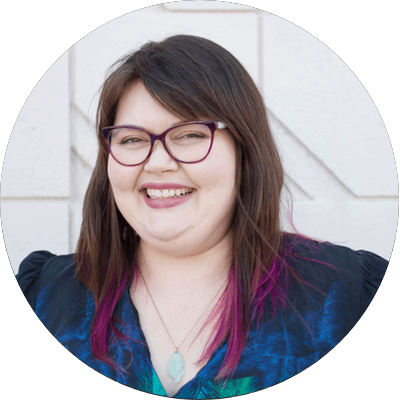 Facebook is prioritizing live content, so I’m making sure that my In Session workshops aren’t just happening via Crowdcast. But that they are being pushed through to Facebook as a live broadcast. So you’ve got to constantly be updating your strategy based on changes outside of your control. And roll with the changes, because your business plan is never set in stone. What you’ll do instead is make some new assumptions, run some experiments, and then tweak based on what you learned. And I’ll look it over and give you any ideas, suggestions, resources, or feedback. Ready to take me up on my challenge? In the comments below, let me know your biggest roadblock in starting your creative business!